Whether you are a media professional, journalist, academic, student or anyone who needs to deal with new or traditional media more effectively Alec can help you improve your presentation skills. 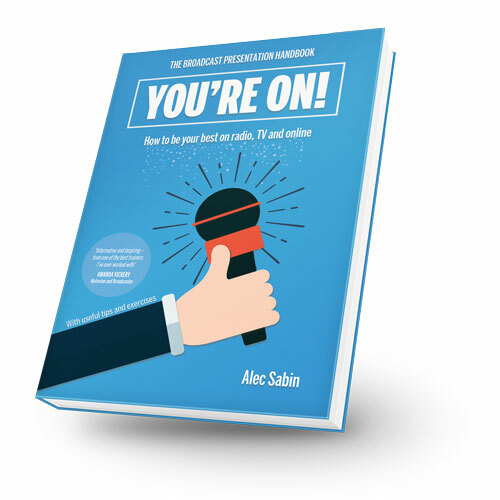 Broadcast Presentation Trainer, Media professional, journalist, academic, student, traditional media, presentation skills, Alec Sabin, author, You're On! Alec offers one-to-one training both in person and remotely via audio/video link. Go to Contact to get in touch. Whether a beginner or an experienced presenter we can explore your needs to improve your performance. It would be hard to overestimate the value of proper attention to voice and breathing in media presentation. Become a confident and assured radio performer by using techniques that will help you engage with your audience. Media training can help you practice getting the best out of a media interview and feel more in control. There are some basic skills that are essential to planning and delivering effective presentations. Alec talks about voice and presentation training for Radio and TV and outlines some training techniques. Alec’s latest book ‘You’re On!’ is available to buy using the link below. The book provides exercises to improve vocal quality and breathing, tips on controlling nerves, and an insight into how broadcast audio and video technology can work for you. There is expert guidance and further exercises on everything from ad-libbing and podcasting to reading a script and interviewing.